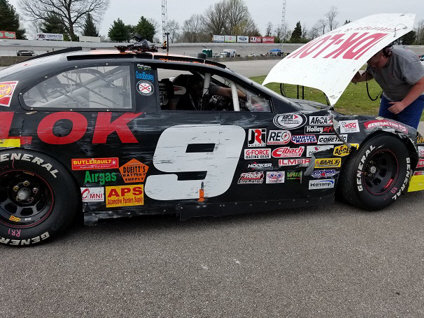 Salem Speedway has become a second home for Thomas “Moose” Praytor with the Mobile, Alabama native making more starts at Salem than at any other track on the tour. Off the trailer the team fought finding grip and the brakes that had been completely rebuilt since Nashville. “Our brakes have really been frustrating this season. We rebuilt and replaced we thought almost everything. We did make it better but still not what we needed. 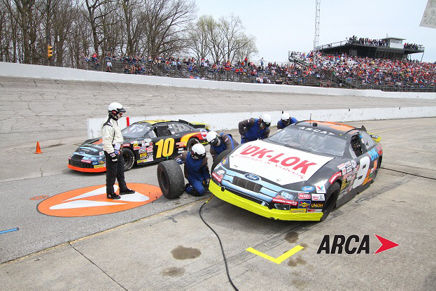 The DK-LOK Ford would time in 18th for the Kentuckiana Ford Dealers 200 fueled by the Hoosier Lottery. Praytor and buddy Mike Basham raced hard in the early going before brake issues led to Basham taking the spot. The early portions of the 200 laps were uneventful as everyone settled in and were racing hard. A lap 80 caution brought Praytor to pit road and 4 tires looking for some more grip. Past the halfway mark Praytor and his DK-LOK Ford got the lucky dog, getting a lap back. Under green, Praytor was able to pick up the pace and was making tracks. As the laps wound down the right front upper control arm mount broke sending the Moose in to the outside retaining wall pancaking the right side of the DK-LOK Ford, settling for 19th.